With vCard ImportExport, you are able to easily import multiple vCard files (.vcf) to your Outlook contacts - simply, select the contacts folder and the files to import - the app will do the job from there. 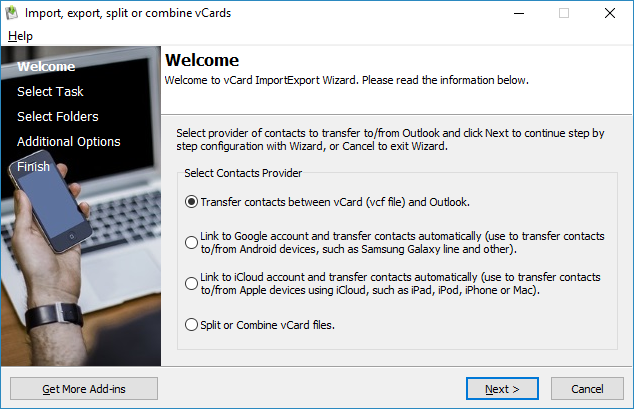 You are also able to export multiple Outlook contacts to the widely adopted vCard format (used with iPhone and Android phones), this provides an openly-supported contacts file that can be sent to any recipient you need to share the contacts with. Transfer your Google or iCloud contacts automatically. Our revolutionary software eliminates the hassle to manually export Outlook contacts to vCard or import vCard to Outlook, and now you are able to do it in large quantities within minutes. Easily transfer your iPhone, Samsung or other Android phone contacts to Outlook or back. Split, combine vCard files (no Outlook installation required). Sync, import, export or move contacts in an easy way. It is not an add-in. It does not slow down your Outlook. Imports and exports single and multiple entries vCard files at once. Can split/combine multiple vCard files into one vCard file. Can be automated - runs from a command line. Allows applying date range filter while exporting. Lotus Notes, Thunderbird, Outlook Express/Windows Mail, Gmail, Apple Address Book, Windows Address Book, iPhone, iPad, iPod, Android phone, BlackBerry, Palm, iCloud and more. You can try vCard ImportExport for free. Click Order Now to get the full version (only from $19.95). "Excellent customer support replies always within less than 24 hours. I initially had trouble with this program but they tried to help and were very quick to respond."